This question came up on the Koha mailing list today: How can I add a Koha login form to my library’s web site? Luckily it’s really simple. The image here is of the one we added one to our site. The only thing you’d need to change to make that snippet work for you is the path.to.your.opac part. Replace that with the full URL of your Koha OPAC, e.g. http://acpl.kohalibrary.com. Of course I wouldn’t recommend putting a login form for your staff client anywhere in public view. Note that using that form will log you in to your default library. If you wanted to give your users the option of logging into a different library you’d have to reproduce the full <select> tag from your staff client’s login page. View the source to find it. This entry was posted in Koha, Koha Customizations and tagged Customization, Koha, OPAC, staff client on July 17, 2009 by oleonard. One of the custom reports I’ve been using recently is one that shows me the most expensive items in the catalog. I’m not trying to figure out which book to sneak out under my coat, I’m trying to find data-entry errors which might cause problems for the patrons. You lost that paperback? That’ll be $4399.00. The trouble is, once I’m cruising through this report making corrections I’m quickly frustrated by the interface for adding items. The list of items is in its own container with the css property “overflow:auto” so that if it exceeds the constraints of the container it’s in it will display scrollbars. It always displays scrollbars. You have to scroll to the right to see the item’s replacement price, then back to the left to find the Edit link. And it’s hard to be sure you clicked the Edit link in the correct row, because once you’re at the Edit link you can’t see the price anymore! 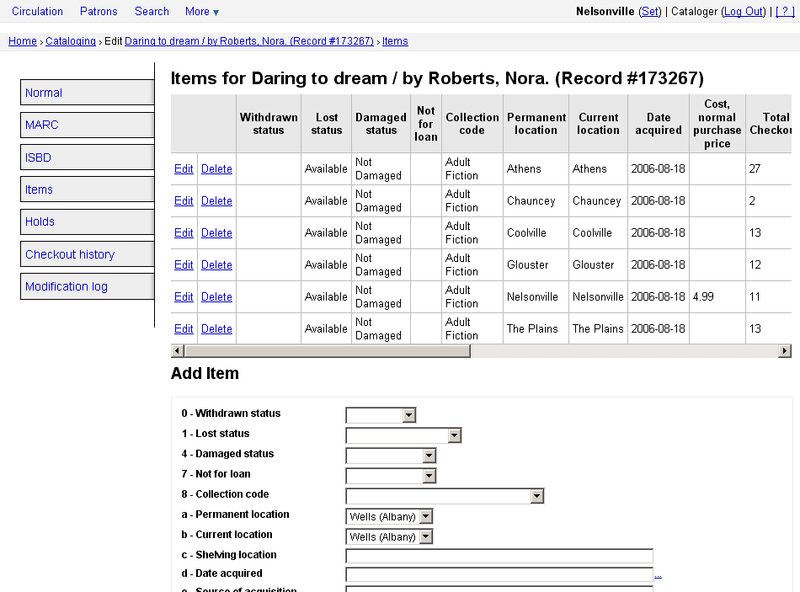 Try navigating anywhere in the table of item details and clicking a table cell. You’ll see Edit/Delete links appear for that row. Implementing this change would allow the user to jump to the Edit or Delete functionality from anywhere in the table eliminating the need to scroll back and forth for the static links. The advantage to the method used in this example is that it’s simple: no generating tooltips or modal dialogs, just a simple append of the Edit|Delete links to the table cell which gets clicked. The disadvantage to the resulting UI is that it could suggest to the user that clicking Edit or Delete will edit or delete just the contents of that cell, which is of course incorrect. It wouldn’t be good for a librarian to expect a click on “Delete” to delete, for instance, only the value contained in the replacementprice field and find that the entire item had been deleted. I’m not sure how to mitigate that confusion while retaining the script’s simplicity. Update: Here’s an alternate, slightly more verbose version. This entry was posted in Koha, Koha Customizations, Koha UI and tagged Customization, Koha, staff client, UI on July 16, 2009 by oleonard. I got a question yesterday on the Koha IRC channel about changing the background of message which appear onscreen during check-in operations. Aparently librarians were not noticing the messages, and the questioner wondered if those messages could be styled in a different way. 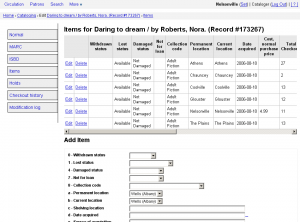 It’s possible to customize Koha’s staff client just like it’s possible to customize the OPAC. At the moment, though, the staff client lacks one useful option: a means of injecting custom inline CSS as we can with OpacUserCSS. The staff client does have intranetuserjs, and that gives us an opportunity to get around the shortcoming. Eye-catching but not very readable! If you’re going for really eye-catching, you’ll have to go for an animated background image! If you find a background image you like, remember: copy the image to your own server. Don’t hot-link it from someone else’s. Nefarious webmasters are likely to swap out the image for something you don’t want to see! Of course I don’t really recommend that you use an animated background. As you’re approaching this kind of change, please remember: changing the style of Koha’s default message box will change all instances of that style box. Koha re-uses that style for displaying informational messages throughout the interface. The staff at the circulation desk may like it, but the cataloger doing MARC imports may not! This entry was posted in Koha, Koha Customizations, Koha UI and tagged Customization, Koha, staff client, UI on July 1, 2009 by oleonard. Koha 3 has always had a selection of built-in reports, and Koha 3 adds additional reports and new a “Guided Reports” system (partially sponsored by this library). The Guided Reports system is still a little rough around the edges, but folks are doing some interesting stuff with them, in particular by using the system’s ability to run custom SQL queries via the Koha interface. I’d like to take some time to explore how we’re starting to leverage the data that Koha collects to build some reports about how the library is being used. I’ll start with circulation statistics. Some of those columns aren’t even used–I’m not sure if they were in the past, or whether there were plans for them for the future. other, usercode, and associatedborrower don’t seem to be in use. datetime records the time and date of the transaction. branch is the location of the transaction. proccode is related to tracking patron fines, payments etc. value records a currency amount (for fines, payments, etc). type records the type of transaction: issue [checkout], return [check-in], renew, payment, or writeoff. itemnumber is the id number (defined by items table) of the item that was handled in the transaction. itemtype is a category assigned to the item as defined in Koha’s Item Type management. borrowernumber is the id number (defined by the members table) of the patron involved in the transaction. Notice how long the query took. The statistics table gets really big: ours has data going back to May 2003, and it has 7,581,248 rows in it. That makes for some slow queries. You should be able to try out these examples yourself using the Guided Reports system in Koha (or right in MySQL if you have direct access to your database). This entry was posted in Koha, Reports and tagged Koha, mysql, Reports, staff client, statistics on March 17, 2009 by oleonard.